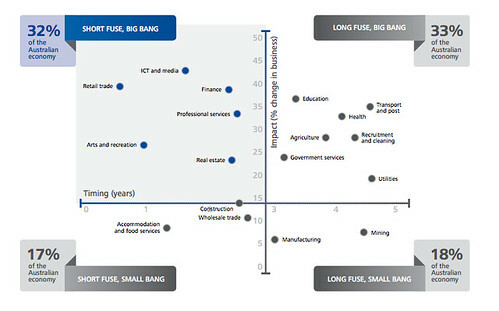 Interesting new report from Deloitte called “Digital Disruption – Short Fuse, Big Bang”. The report looks at how digital technologies will disrupt industries over the coming years. This chart caught my eye. Deloitte write: Digital innovations are transforming the economic landscape far more profoundly than any other big shifts, such as deregulation, oil shocks or mining booms and the way companies operate and engage with their customers is already significantly different to how it was only a few years ago. My copy is downloading at the moment. You can get yours here.